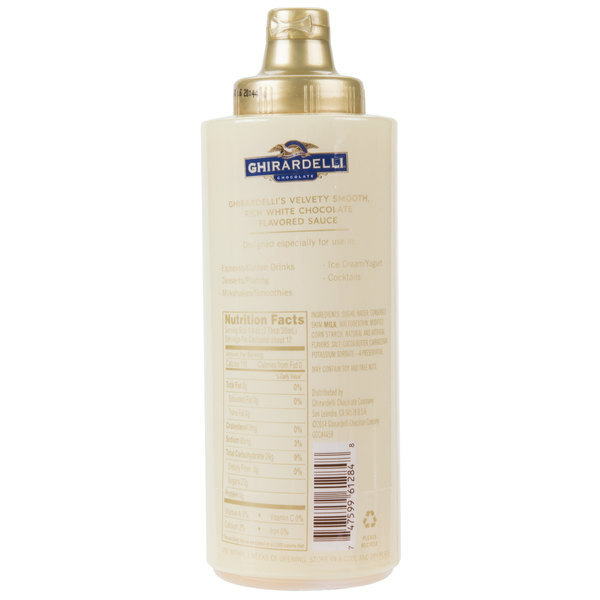 Perfect your signature espresso-based drinks with Ghirardelli 17 oz. white chocolate flavoring sauce! Made with cocoa butter and premium ingredients, this sauce has a creamy white chocolate flavor and velvety-smooth consistency for crafting your coffee shop drinks. Use it for lattes, frappes, milkshakes, and even frozen cocktails. Besides beverages, this indulgent white chocolate sauce is perfect for topping ice cream, frozen yogurt, fruits, pastries, and many other decadent desserts. Not only does it enhance the taste of your tempting treats, but it also improves the look and presentation of your offerings to delight patrons and help boost impulse sales. Customers will recognize and trust the Ghirardelli name when they see it in your cafe, coffee shop, ice cream parlor, or restaurant. Ghirardelli began with a young Italian chocolatier in the early 1800s and is now a brand widely known for its rich flavors. This sense of quality is the result of Ghirardelli's commitment to control all steps of the chocolate-making process, from roasting the cocoa beans, to refining the product for smoothness and well-balanced flavor. In addition, the company understands that sustainable sourcing and knowing the origins of the cocoa beans speaks to the quality of the finished product. No matter what dish or drink you prepare, guests are in for a treat with this white chocolate flavoring sauce! Ghirardelli products are a standard in my kitchen. The premium ingredients come together for an amazing flavor that everyone enjoys. I use the sauce to drizzle on deserts and drinks. This White Chocolate flavoring sauce is awesome. I drizzled it on cakes, cheesecakes, & pies. It taste heavenly! My kids love it on their strawberries. I really like the flavor of this sauce. I would not say it tastes like white chocolate because it has what comes across as an almond like flavor to me but non the less this is great in coffee. I was not overly impressed with this sauce. It did not taste much like white chocolate. It was very sweet and had a hint of almond flavor to it. If I hadn't looked at the bottle, I would probably think it was some kind of a vanilla wafer melt syrup, not white chocolate. This is definitely a sauce. It's thickener than those syrups, which are really a lesser consistency than syrup. The flavor is there, rich and creamy. It's great as a flavoring or topping to almost anything. Love this sauce ! i add it to my buttercream frosting for a nice flavorful white chocolate frosting - it makes a great drizzle too . Great quality product at a fair price - i recommend this product if you are looking for that kick of white chocolate flavor . 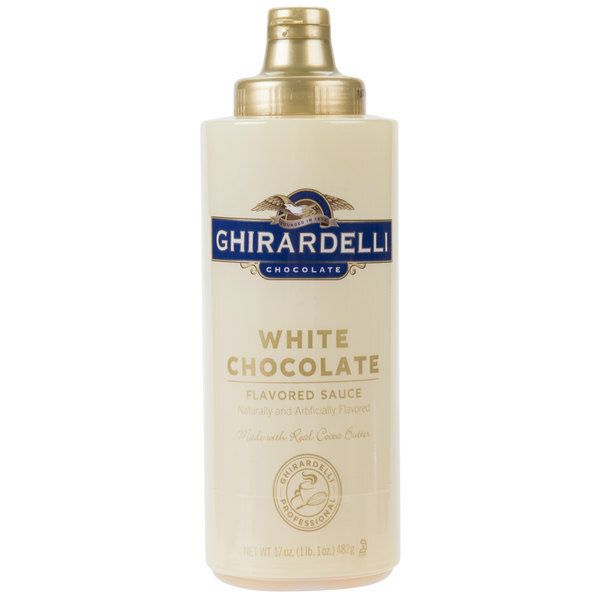 This white chocolate Ghirardelli sauce is a perfect compliment to other lines of chocolate I keep in my coffee line up. 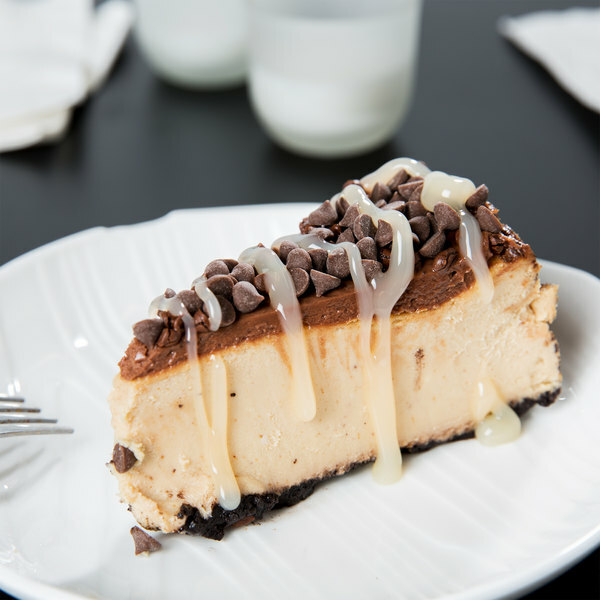 This sauce mixes better than the chocolate or caramel options, and gives a nice creamy taste. It allows me to make coffee house type drinks at home, instead of spending a lot of money at coffee shops! Amazing Flavor ! What a great addition to our sauce line up. Customers are very happy with this option. It is thicker than most syrups so consider warming slightly or at the least room temperature. This 17 ounce white chocolate flavoring sauce is a very good chocolate sauce. It is great for topping coffees or ice creams. Love Ghiradelli brand. We use this sauce at the coffee bar at my café. The flavor is delicious and our guest really enjoy it. It is by far superior to other brands. Love the white chocolate sauce. We use all the Ghiaradeli sauces in our shop and they never disappoint. The bottles have a clean design and nice pointed nozzle for dispensing. Label added to the side of the bottle for no reason. It is very sweet and has an artificial taste to it. We will probably not order it again. 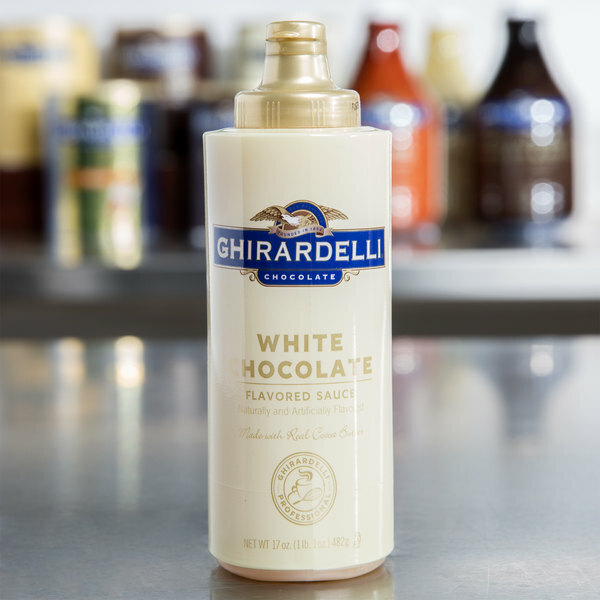 Though we much prefer the Ghirardelli white chocolate powder to the sauce, these small bottles are super convenient for drizzle on top of drinks. I suggest keeping the flip top cap closed when not in use because the high sugar content of the sauces can make the sauce dry out and crust around the top. This is also a necessary product for every coffee shop, as people look for the brand Ghirardelli. 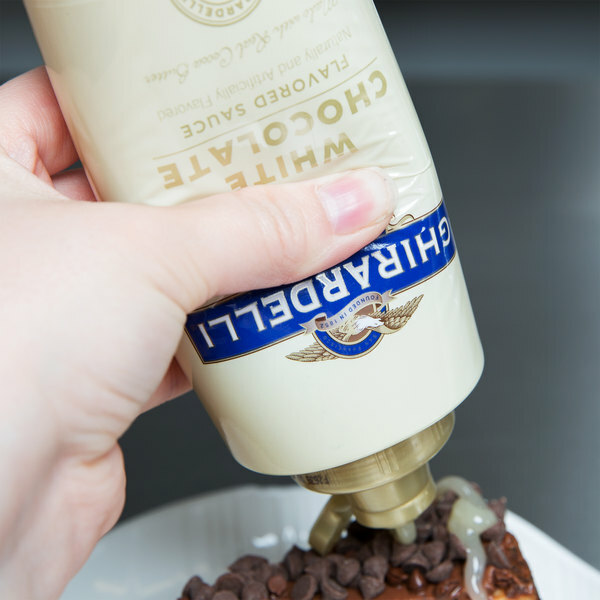 You never knew you needed white chocolate sauce this much until you taste this! Hi bought this on a whim and was so happy I did! It is great on just about everything but extra special on hot chocolate with whipped cream.